These pancakes are healthy and will only take a few minutes to make. Make the mixture in bulk and store it in the fridge! Combine the mashed bananas and eggs in a large mixing bowl. Stir in the ground almonds, ground linseed, baking powder and cinnamon, then fold in the blueberries. Heat a little oil in a frying pan set over a low heat. Spoon in some of the pancake batter and cook over a very low heat. Take your time and don’t rush. When the pancakes are golden brown on the bottom, flip them over and cook the other side until golden brown. Drizzle with honey and serve with natural yogurt. 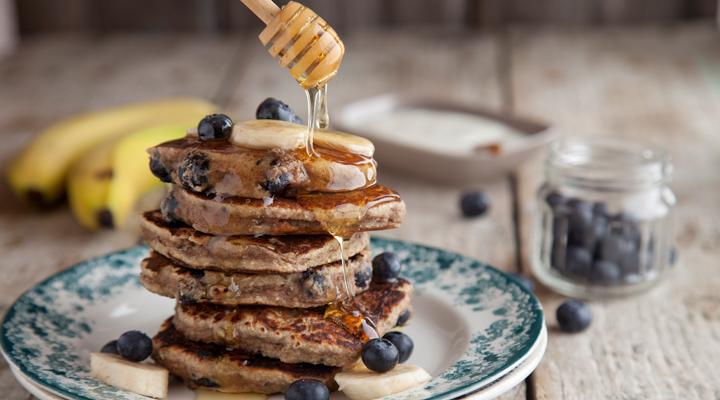 Adults and kids alike loved these healthy and nutritious pancakes:) keep the recipes coming. We found the recipe on Instagram and made these over the weekend. They are delicious! We've been cutting back on eating bread and these are a perfect Sunday morning breakfast. Keep them coming!